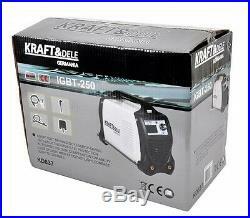 Branded tools at low prices. A Perfect Tool Store. Full after sale service. 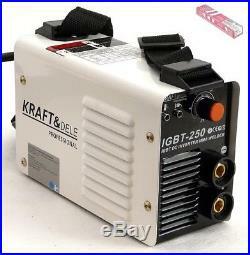 Kraft & Dele IGBT 250A KD843 MMA ARC Welder Inverter – welding machine + 2.5kg rutile electrodes 2.5mm. 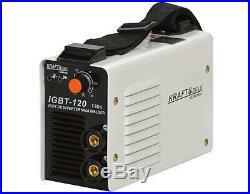 Range of modern welding inverter K RAFT & DELE GERMANIA made in the latest technology, high-through transistors (with electronic inverter throughput) is designed for arc welding coated electrode (MMA), and after a suitable torch – tungsten inert gas (TIG). 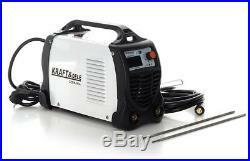 Welders are characterized by much smaller dimensions and weight compared with conventional welding machines, making them particularly suitable for any installation. The function MMA IGBT inverter technology Infinitely adjustable welding current 20-250 The possibility of use of electrodes 1.6 – 4 60% duty cycle at 250A Function HOT START ARC FORCE ANTI STICK Equipped with thermal protection and fan. HOT START – This system allows us to increase the current at startup for faster ignition of the welding arc. ANTI STICK – function prevents sticking electrodes for welding material. ARC FORCE – an automated system to stabilize the arc, regardless of its length. 250A welder KD843 2.5kg electrodes 2.5mm MMA welding cable with electrode holder DIN Ground cable with DIN Welding mask Brush User manual in Polish language. Power supply: 230V 50/60Hz Adjust welding current: 20-250 A Phase 1 Duty cycle: 60% – 250 A Performance: 100% – 193 A The diameter of the electrodes: 1.6 – 4.0 mm The arc: Contact Degree of protection: IP21S Welding cable length: 2 m Cooling: forced (fan) Dimensions: 350 x 230 x 275 mm Weight: 5 kg The manual comes in a Polish language. 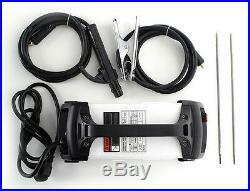 Please note that the inverter includes European/Continental plug, don’t worry we provide UK converter. 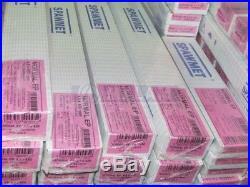 Deliveries to Northern Ireland, Scotland, Channel Islands, etc. Might take longer, and might charge extra costs for this. We take unprecedented measures to guarantee your things arrive securely and in place. 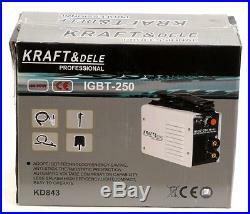 With this option, you will receive Grey Eagle Shop’s bank details when creating an order. Safely pack item(s) in a unique bundling, including documentation, manuals, guarantee data, registration, and so on. We are not in charge of lost or harmed packages. On the off chance that you are not 100% fulfilled by your item, you can return or trade your request inside 30 days from the date of receipt. Safely package things as we are not in charge of any things lost or harmed in travel. Any item not in “sellable” condition. Future Changes We are fully entitled to change these terms whenever we wish to do so, the changes will be presented on this page, the landing page, and different areas we consider proper with the goal that you know about the set of accepted rules of our administration. We save and are qualified for all rights to adjust, modify, change or overhaul these terms at any given time, so please check back from time to time. Check my other listings. Unit 4e Enterprise Court. S63 5DB, United Kingdom. South Yorkshire, S63 5DB. Subscribe to our newsletter. Add to favourite sellers. 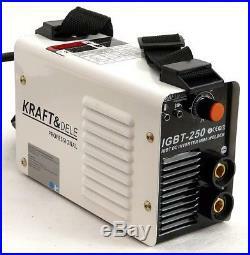 The item “KD843 250A ARC Welder Inverter by Kraft&Dele Professional+2.5kg ELECTRODES” is in sale since Thursday, October 12, 2017. This item is in the category “Business, Office & Industrial\Metalworking/Milling/Welding\Welding & Soldering\Welding\Welders, Cutters & Torches\TIG Welders”. 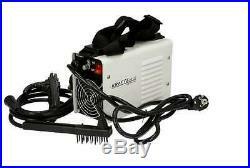 The seller is “greyeagleshopcouk” and is located in Heanor, Derbyshire. This item can be shipped worldwide.